What if you took the best of RTS, but removed the real-time? 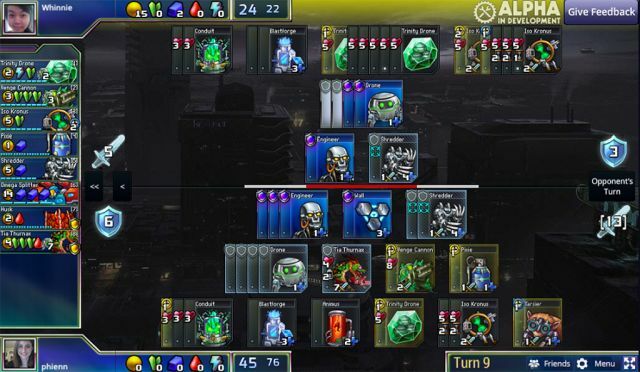 Prismata, the energetic debut from Lunarch Studios, boils strategy down to its purist form then presses ‘fast-forward’. Players compete against other humans or ruthless AI opponents, progressing through quick-fire turns while building up broader strategies. Already in private alpha with 3,000 players registered, Lunarch’s recently launched Kickstarter reached $6,316 in just 24 hours. To celebrate, we’re offering the chance to go hands-on with the game and interview the studio’s co-founder, Elyot Grant. Playing Prismata In Prismata, players take turns spending resources, building up economies, constructing an army, and obliterating the opposition until only one side remains. Games last only minutes, but always feel fresh thanks to randomly-generated unit pools that are unique to each match. Each game, there are new units to construct, new build orders to plan and discover, and new threats to respond to. How will you become victorious? No pre-built decks. No random advantages or luck-of-the-draw moments. Prismata celebrates quick-fire tactics and decisive strategy. It’s a turn-based StarCraft without a map; Hearthstone, only with workers and build orders.